To say that Atlanta Braves pitcher Kris Medlen is currently the hottest pitcher in baseball would be like saying Albert Einstein was kinda smart. Medlen is doing things that haven't been done in Major League Baseball in nearly 60 years. The Braves have won 21-straight games with Medlen as the starting pitcher. The last time that happened was from 1950-1953, when Whitey Ford's Yankees won 22-straight when he was on the hill. The Braves lost the first 2 starts of Medlen's career back in 2009, and haven't dropped a game he's started since then. If my math is correct, that means they are 21-2 when he is the starting pitcher. That, my friends, is just plain sick. Medlen's ERA this year is a microscopic 1.51. But as a starter (he began the season in the bullpen), his ERA is a Bob Gibson-esque 0.76. Don't rub your eyes. I said 0.76. Three quarters of a run per game. You realize that means all Atlanta has to do is score once in order to win, right? 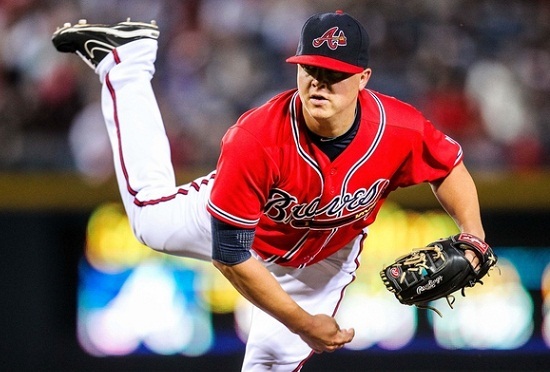 If the Braves make the playoffs (yes, I know they should, but after last year's collapse, I take nothing for granted), they can point to Medlen's performance as a major factor. As a matter of fact, if I was manager Fredi Gonzalez, he would probably be my number one guy in the postseason. If you need more perspective on Medlen, remember that he had Tommy John surgery just over 2 years ago, and he started this season in the bullpen to protect his workload. The team ahead of Atlanta in the standings, the Washington Nationals, had almost the exact same situation with their ace, Stephen Strasburg. In fact, their Tommy Johns surgeries were less than 2 weeks apart in 2010. Both were given 160 innings as a workload limit this year. The difference in the two? Strasburg began the season in the starting rotation and has been shut down for the year, while Medlen is poised to potentially help the Braves during a playoff run. One would think such a dominant performance would cost the Braves a fortune, but not so. Medlen's salary is a paltry $490,000 per year. The Nationals are paying Strasburg $3 million. Back in the 40s, the then-Boston Braves had "Spahn and Sain and pray for rain," referring to the pitching tandem of Warren Spahn and Johnny Sain and their effectiveness. Perhaps this year, someone will coin a catchy phrase and scenario where Medlen can pitch every game. Maybe something like "Medlen and rain, then snow, then a scheduled off day, then Medlen again..."
Okay, that isn't quite as catchy, but Medlen is certainly just as effective as the other two. Be afraid National League. Be very afraid. You know Washington is wishing they had used Atlanta's method with Strasburg. It'll be ironic as hell if the two teams meet in the postseason and Atlanta knocks them off. They've handled this kid beautifully. I can't wait to see what kind of career he has. Nice post. Thanks, guys. I really intended to compare him to another former Braves pitcher in his approach and method. He reminds me a lot of Greg Maddux. He doesn't blow hitters away, but throws hard enough, changes speeds faster than a Tour de France competitor, and hits his spots. If he follows that formula, he'll be successful for years. Just hope the Braves are smart enough to hang on to him. Great approach like that Strasburg article explained. Nats should've used him like Medlen, ultimately though I think Medlen doesn't compare to Spahn, OR Sain.